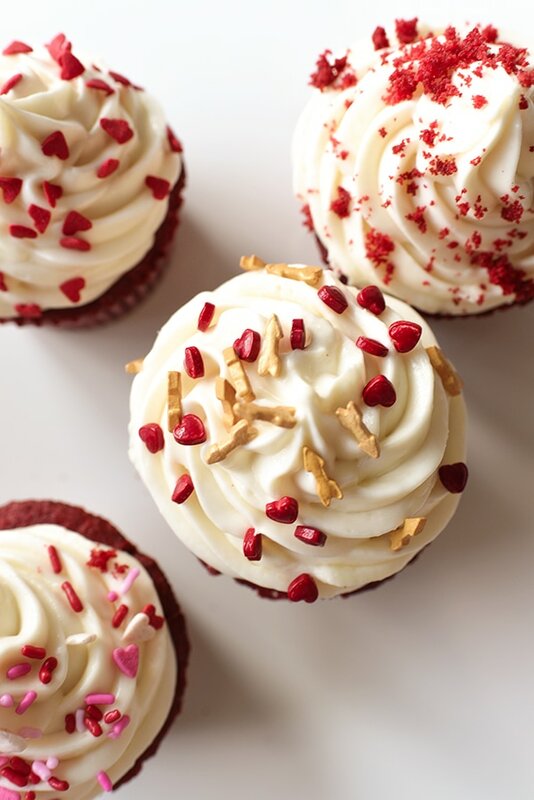 Red velvet cupcakes are one of my favorite cupcake flavors. Made right, they’re light as air, and when there’s a delectable cream cheese frosting on top, I find them positively irresistible. My red velvet cupcake recipe has just a hint of chocolate from this rich, naturally-red cocoa powder and I use a smidgen of sour cream in the frosting to give it a little more tang. I suspect it’s that I’m actually most enamored of… and I could put it on a spoon and be almost just as happy about it. 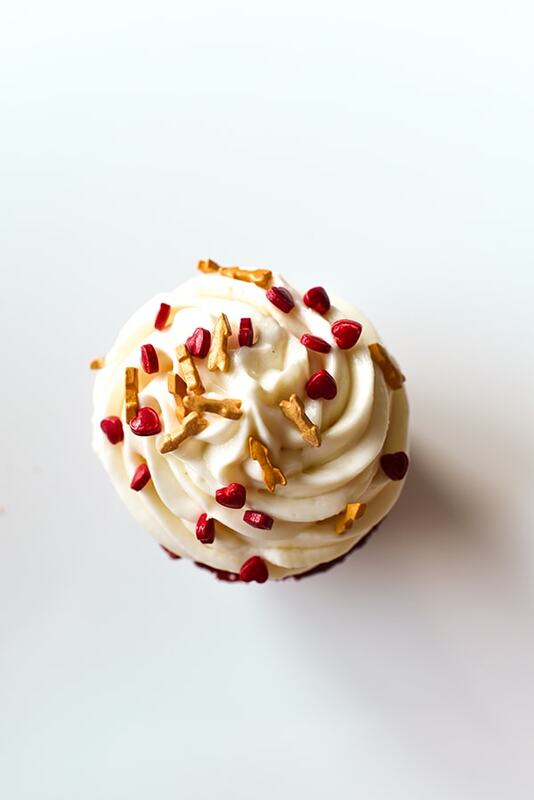 But the super soft, just oh-so-slight-chocolate-flavor of the cupcake underneath takes this red velvet recipe over the top. I should present this red velvet cupcake recipe, however, with a caveat. Which is not something I normally do. But, I wouldn’t really recommend using this red velvet recipe to make a cake. If you are really keen on making a cake, let me know below, and I’ll do some testing and see if I can come up with a workaround. 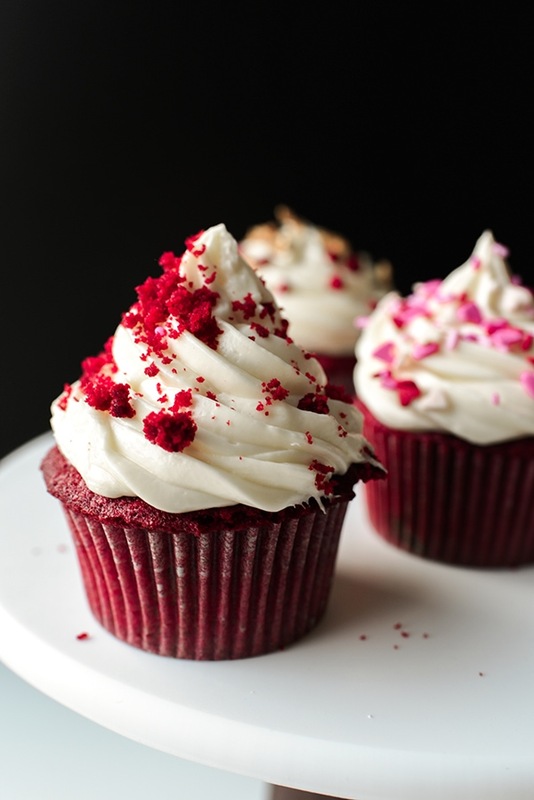 These Red Velvet Cupcakes are incredibly moist and fluffy, but one thing they are not is dense. In fact the red velvet cupcakes start to sink and get a little wobbly when you remove their cupcake liner. I would imagine if you turned these into a cake, the problem would get exponentially worse, so I don’t recommend it. Unless you’re the kind of person who doesn’t mind sunken delicious cakes. In which case, carry on. 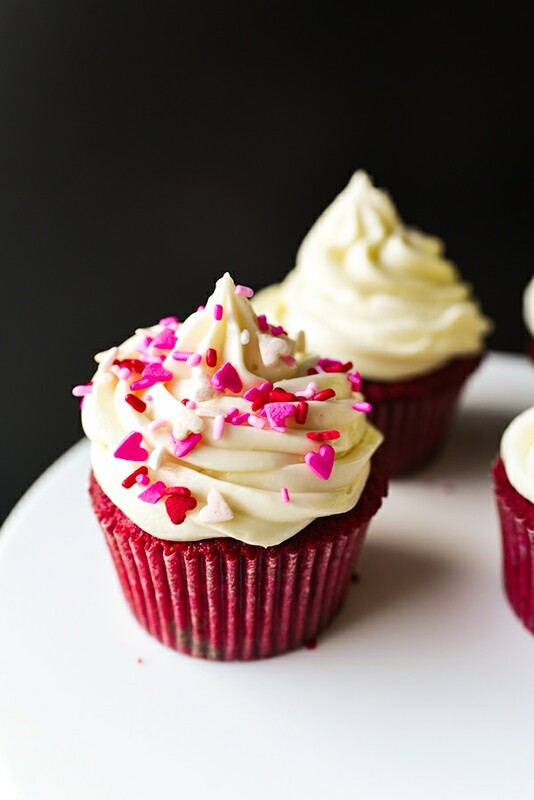 They do however, work as cupcakes and are perfect if you’re looking to bake a batch for Valentine’s Day or Christmas or July 4th or Red Velvet Cake Day on September 18th. I topped some of the cupcakes below with Wilton decorations that I found at Target, but classic sprinkles would look cute too. Or even, just plain cream cheese frosting like the one below! What Flavor is Red Velvet? Let’s start by dismissing the notion that red velvet is chocolate. It’s not chocolate. Because I have a confession to make. I wouldn’t eat red velvet. (I’m a monster.) For a long time, I thought red velvet cupcakes were just chocolate cake dyed red. And I really really do not like chocolate cake. So, I avoided them. But, according to a New York Times’ article that explores the history of red velvet, cocoa wasn’t even an essential element back to the red velvet recipe was first created. Velvet cakes — soft cakes with a finer texture than your standard chocolate or vanilla cake — were made with almond flour, cornstarch, or cocoa. suggests that it isn’t meant to be a chocolate cake. What is that? Velvet? Yes. Chefs riffed on this idea for a while and eventually, astute business man John Adams of the Adams Extract Company (not the 2nd U.S. President) wanted to sell more food dye and thought that creating a recipe for a cake that required its use might be a way to go. And, thus, red velvet was born. The original recipe called for a whopping 1 ounce of dye. That’s more than entire bottle of Wilton or Americolor food coloring… great for selling dye I guess as it required two of their bottles, but feels a little like overkill. Is there not a law of diminishing returns on color saturation? Welp, we’ve added 1/2 a bottle… might as well add the rest to really amp up the color another 1%! However, the dye-soaked red velvet cupcake recipe does only call for 3 tablespoons of cocoa powder, which hardly makes it chocolate flavored. For comparison, Molly Yeh’s chocolate cake has a whopping full cup of chocolate. Which invites the question – how much chocolate does it take to make a cake chocolate-flavored? To the comments section, Batman! So, it turns out I was pretty much icktified by Red Velvet Cupcakes for nothing. Such is life. I am, however, now pretty intrigued to try out their other recipes. I also, have since created these Red Velvet Donuts which are fun to make if you’re on a red velvet kick. My red velvet cupcake recipe isn’t all that different from the “original” red velvet cake recipe by Adams (quotes because there’s still some disagreement whether or not the recipe was first developed by the Walfdorf Astoria), though I’ve made some tweaks. Notably, I’ve decreased the cocoa powder amount even further and dropped the dye amount because for some reason I want my cupcakes to taste like cake, not food coloring. And, I’ve swapped their frosting for a cream cheese frosting because I’m sorry, you can’t put buttercream frosting on a red velvet cupcake. Just, no. To make red velvet cupcakes, preheat the oven to 350°F and line cupcake tin with 15 cupcake liners. Combine all of your dry ingredients — cake flour, baking powder, salt, cocoa powder — in a small or medium bowl and set this aside. Pour one teaspoon of white vinegar into a small bowl and set this aside. Fill 1/4 cup measure with buttermilk and set this aside. Now, cream the room temperature butter and the sugar in the bowl of a stand mixer for 3 minutes at medium-high speed. Add the egg and let this combine for 30 seconds. Add the vanilla and 3-4 drops of red food coloring. 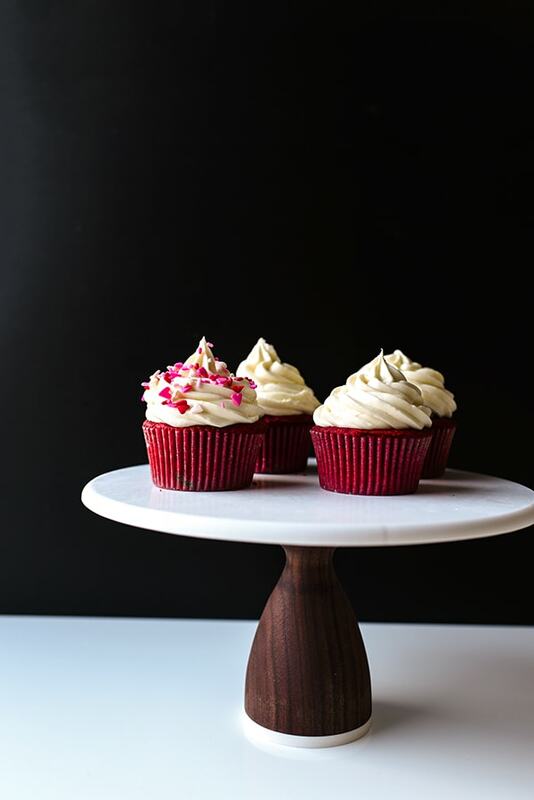 This red velvet cupcake recipe will not be as super bright red as the aforementioned one, but you also won’t be eating as much red food coloring, which can change a cupcake’s flavor. Once the red velvet mixture looks fully combined — stop and scrape down the sides if it looks like the batter needs it — turn the speed to low and add half the dry mixture. Add the buttermilk and refill the measuring cup. Add the dry mixture. Add the remaining buttermilk. Let them mix for about 30 seconds until it looks like it has fully combined. Then, stop the mixer. Add the baking soda to the vinegar, stir, and pour the fizzing combination into the batter. Turn the mixer on high speed for 30 seconds. Scoop out the red velvet cupcake batter into the cupcake liners using a 1/4 cup scoop or a #16 disher. Bake for 15-18 minutes until the cupcake tops bounce back just slightly when touched. Let the Red Velvet Cupcakes cool completely before topping with cream cheese frosting. 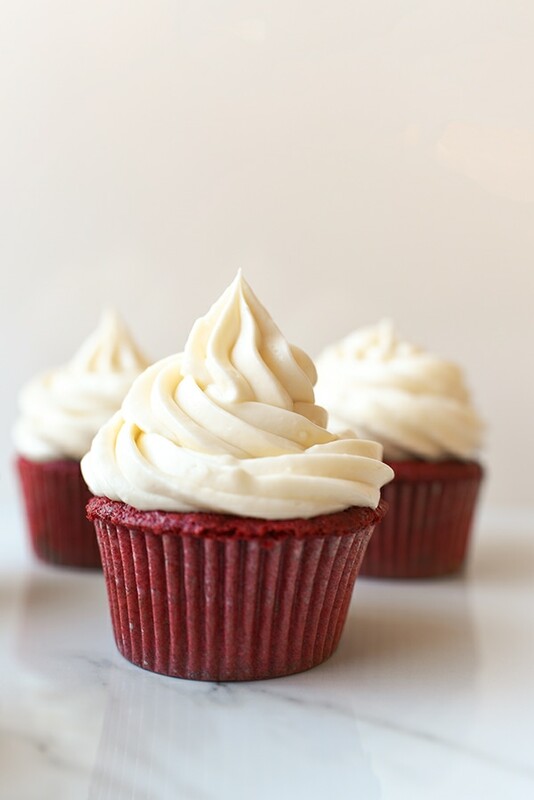 This moist red velvet cupcake recipe is easy to make and topped with a delectable cream cheese frosting. Add sprinkles to make these cupcakes festive for Valentine's Day or Christmas! Preheat oven to 350°F. Line cupcake tins with 15 cupcake liners. Mix cake flour, baking powder, salt, and cocoa together in medium mixing bowl. Set aside. Pour buttermilk into ¼ cup measuring cup. Set aside. Add vinegar to small bowl. Set aside. Cream butter and sugar in stand mixer at medium speed until light and fluffy. Approximately 3 minutes. Add egg to batter. Mix for 30 seconds until combined. Add vanilla and food coloring. Scrape down sides of bowl if needed. Turn mixer speed down to low. Add half of flour mixture. Add buttermilk and refill measuring cup. Add remaining flour. Add remaining buttermilk. Let combine for 30 seconds. Scrape down sides of bowl if needed. 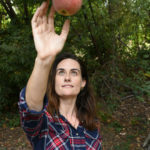 Add baking soda to vinegar. Stir. Quick add to batter. Portion out batter into cupcake tins using #16 disher or ¼ cup measuring cup. Bake for 15 minutes or until tops bounce back slightly when touched. Remove from oven and let cool on cooling rack. Beat butter for 30 seconds on medium high using paddle attachment. Add cream cheese. Beat for 90 seconds. Add sour cream and beat for 30 seconds. Add confectioner's sugar and beat on low for 10 seconds. Turn speed up to medium-high and beat for 80-90 seconds. Transfer to piping bag. If you want enough frosting to decorate the cupcakes as pictured, make a double amount of cream cheese frosting. Just in time for Valentines Day! Everyone will love this in my family! 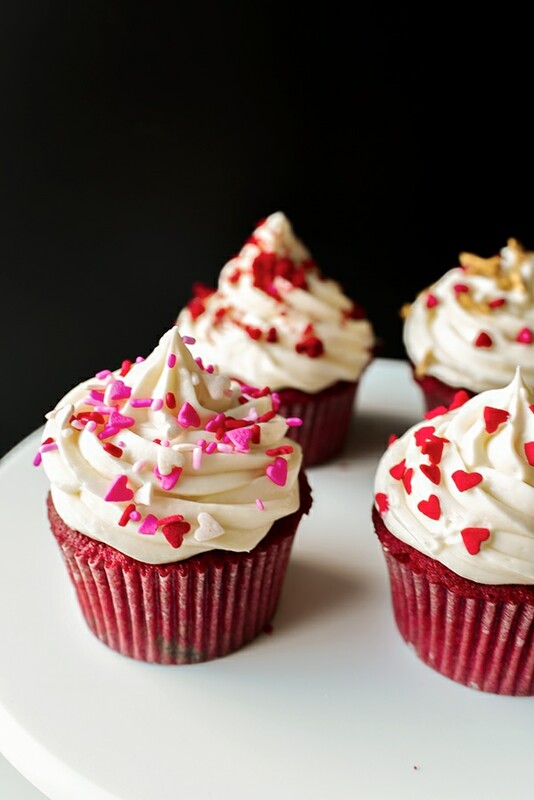 Those cupcakes look perfect for Valentine’s Day!! 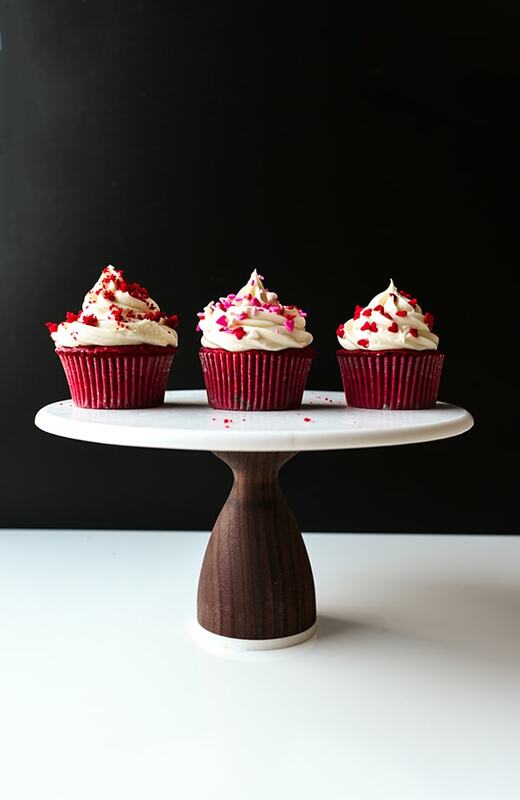 You can’t beat Red velvet cupcakes – they’re just so delicious! You’re right, these would make a fabulous Valentines gift l! I love red velvet cupcakes, always so fluffy and moist. The cream cheese topping is the icing on the cake (excuse the awful pun), but it is just right to perfect the dreamy little cakes. can this recipe be made into a sheet cake? Hello Edith! I haven’t tried this recipe as a sheet cake – I would be a little hesitant to do so as it has such a light crumb.